Deep groove ball bearings are versatile, self retaining bearings with solid outer rings, inner rings and ball cage assemblies. 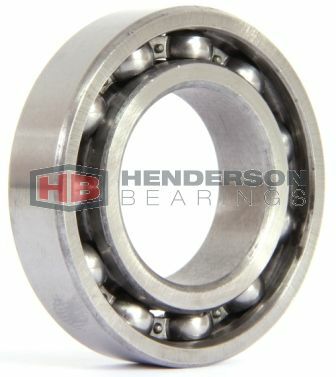 Sealed - These bearings have the suffix 2RS indicating they have lip seals on both sides and are pre-filled with grease for life, so no lubrication is required. The seals give some protection against ingress of moisture and contaminating particles entering the raceways, thus increasing the life of the bearing. Some applications require only 1 seal which can easily be removed. 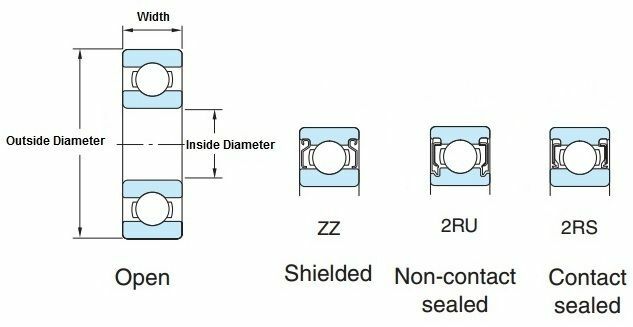 Shielded - These bearings have the suffix 2Z or ZZ indicating they have gap shields on both sides and are pre-filled with grease for life, so no lubrication is required. The shields give some protection against ingress of moisture and contaminating particles entering the raceways, thus increasing the life of the bearing. Some applications require only 1 shield which can easily be removed. In the very unlikely event that we should not have available free stock , a quality brand will be supplied. If large quantities are required click add to quote.